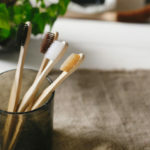 If you want to start taking steps toward living a greener life, one of the easiest things you can do is switch up your cleaning routine. 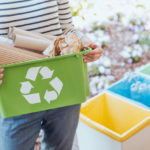 While that big bucket of store-bought sprays, wipes, and chemical peelers might seem like the best way to get your home clean, there are actually more eco-friendly options that will get the job done just as well. 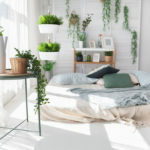 What’s more, those green cleaning choices often cost less, and they’re safer for you and anyone who shares your living space. So, how can you get started today? 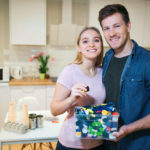 Here are five green living tips for a more natural cleaning solution! When your sink or bathtub starts to get dirty, you know exactly how tough it’s going to be to get them clean. That’s why some of the harshest cleaning chemicals on the market are geared toward being used for these jobs. But if you want to save your skin some irritation and give your home a nice, fresh scent, take Apartment Therapy’s advice and use a grapefruit. Simply take a grapefruit and cut it in half. Sprinkle the top with coarse salt and also sprinkle in your tub or sink. Scrub until the fruit is all used up. You’ll be surprised how clean things have gotten. Citrus is featured in a lot of recipes precisely because of how pleasant it smells. If your air feels stagnant, instead of spraying chemical air freshener, consider using an orange. According to Green Living Tips, cut your orange in half. Then, scoop out the fruit so the peel is a little bowl. Next, put a tablespoon of salt into the bowl. It kills bad odors and leaves a room smelling like an orange! Perfect for bathrooms. How much bleach do you add to your whites? Well, consider Green Living’s advice to add lemon juice to your wash. 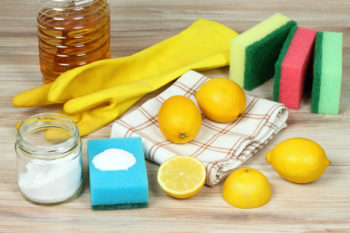 In fact, adding half a cup of lemon juice to the rinse cycle will get your whites even whiter, and help you avoid using more harsh chemicals. Clogged drains are a serious problem. Yet, the chemicals that solve them can sometimes be even worse. So the next time you have a clogged drain, boil some vinegar and pour it down. This should be enough to dissolve the clog and move it along. As Better Homes & Gardens points out, vodka is an under-used cleaning agent, particularly for glass and mirrors. Simply spray the vodka directly onto the surface and wipe it clean with a microfiber cloth (or with plain old newspaper, which actually helps reduce your streaks). For more green living tips, simply contact us today. Or, check out our blog for more valuable articles that support your go green lifestyle.